Wedding planners can be overpriced (and overrated), but the less you have to worry about, the better. So try to find a venue that does most of the work in-house. 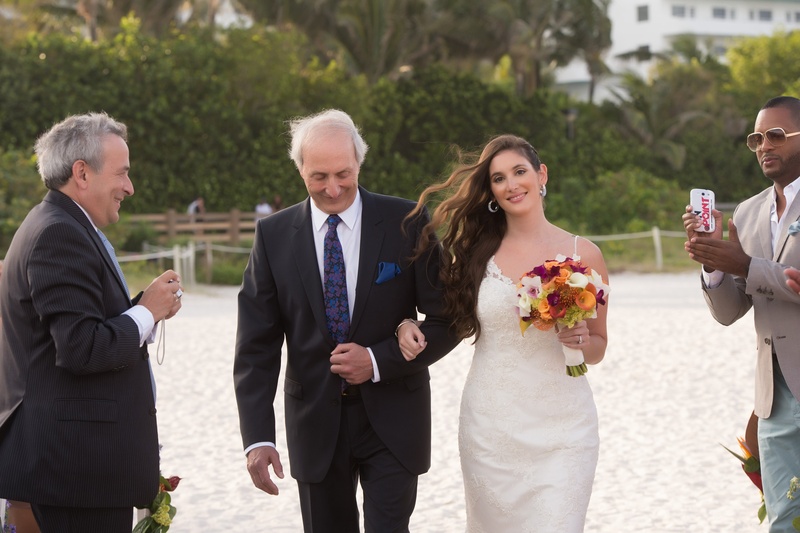 For example, our wedding was at The Palms Hotel and Spa in Miami Beach. 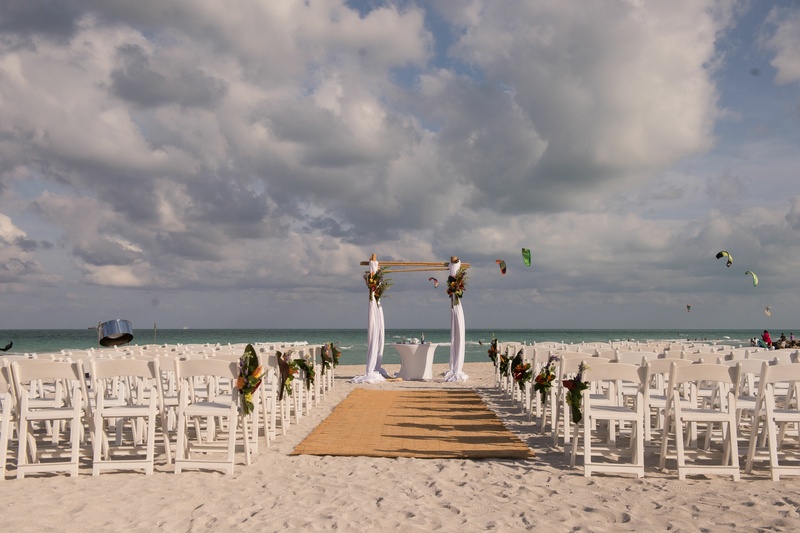 In addition to providing a venue with several gorgeous location options (a sandy beach, a tropical gazebo, two ballrooms to choose from, and a stunning poolside rehearsal dinner)… everything from the catering to the chairs & table cloths were included. 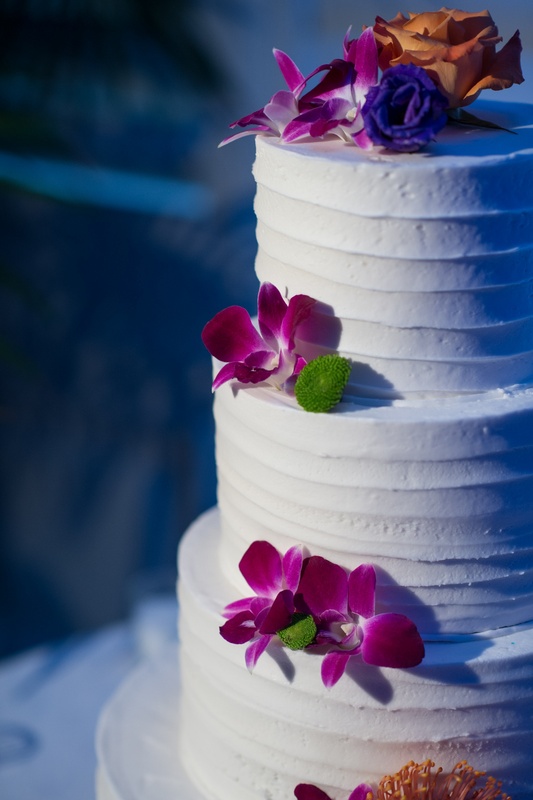 We had two bakeries to choose from (even our wedding cake was included in the package), plus they had a close relationship with an incredible florist, and a world class spa on-site (for all your hair, makeup, and pre-vow pampering needs). The hotel’s wedding coordinator kept in contact with all our outside vendors (the DJ, the officiant, the photographer, etc.) to make sure everyone was setup on time, and ensured that things ran smoothly day and night. We all hope for sunshine and blue skies, but tropical climates can be tricky. Make sure you have alternate options available in case of rain… or hurricane. We reserved a beautiful covered veranda overlooking the lush property, just in case we couldn’t have our ceremony directly on the sand. Think of it as insurance; if you have it, you’re more likely not to need it. There’s a reason most destination weddings are small, so don’t set yourself up for disappointment. Traveling can be expensive and your family and friends will need to book the time off of work. If you want more people to show up, give your guests at least a years notice, and still, be prepared to hear a lot of lame excuses (eye-rolling optional). The truth is, the people who really want to be there, will be there, and that makes it so much more meaningful. The beauty of an intimate getaway with all your favourite peeps, is that by the time the big event arrives, most of your guests will know each other, having bonded all weekend long, which makes for a seriously fun party to cap things off (let’s just say the uncle you thought was square, could end up being the guy turning up the dance floor with your groomsmen). Loot bags aren’t typically an important part of weddings (many people give edibles, like chocolates), but since your guests are traveling far and wide to be there, it’s nice to give back a little something extra. 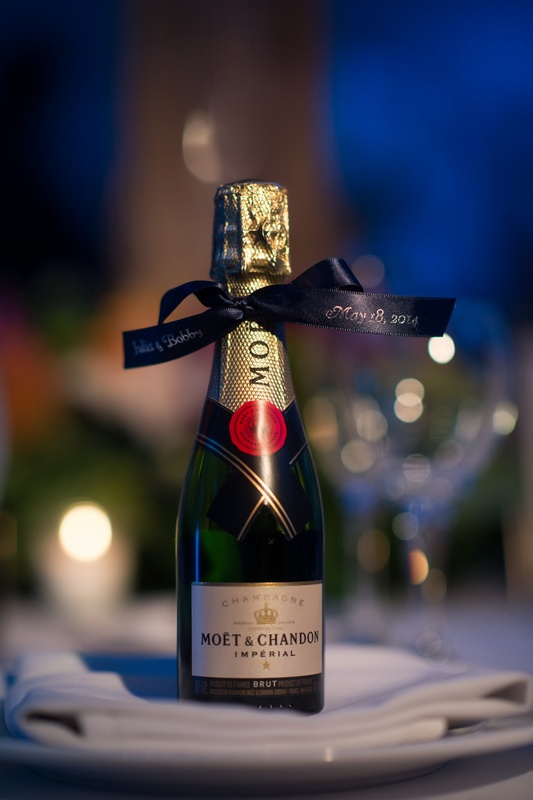 We splurged and gave each of our (drinking age) guests a mini bottle of Moët and Chandon, and completed the look with custom ribbons from Beau-coup.com (which also worked perfectly tied around giant swirly lollipops for the kids). The champagne bottles were elegant and festive around the tables, and they were a huge hit as they kept the party going with next-day-bottle-popping by the pool! This is not the trip that you want to be having a sudden Home Alone “KEVIN!! !” moment on the plane, so start a packing list WAY in advance, and add to it as little things come to mind. I literally had a nightmare days before we left that I forgot my own wedding gown. So whether it’s your ‘something borrowed’ or your ‘something blue’, get organized now, and leave nothing in the hands of your last minute bride-zilla jitters. It’s hard to trust a vendor that you can’t interview in person, so we recommend using a trusted website like TheKnot.com to tie up some of your loose ends. You can search for vendors by their geographical location, and they’ve got every category covered (from videographers to steel drum players to full 8-piece bands). Make sure you browse through a lot of reviews and check out their portfolios and rates. If they’ve won a “best of weddings” award then you can rest assured they’re the real deal. And make sure you pay it forward after the fact, by leaving your own reviews for all the future brides-to-be!